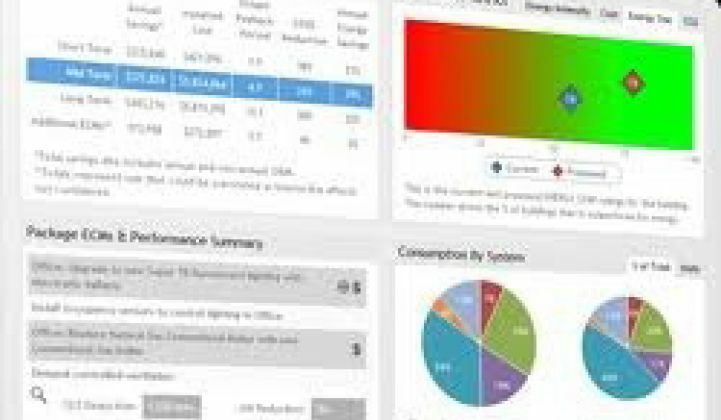 A building energy data-crunching startup links up with a big utility efficiency program vendor to make identifying, executing retrofits faster and cheaper. Building energy efficiency is about the simplest green investment out there, and has the potential to save U.S. buildings a trillion dollars in wasted energy over the next decade for about $279 billion in investment. So what’s the holdup? Well, it turns out that efficiency projects are pretty complicated, and take several steps to get from good idea to reality. One tricky part is finding the buildings with the most potential for efficiency savings, and then targeting the money for auditing, retrofitting and running them in a way that makes it a profitable venture for everyone concerned. Retroficiency, the Boston-based startup that crunches public and proprietary data to create building energy models at fractions of the cost of old-fashioned energy audits, says it can help on this front -- and it just landed a big partner to try it out. That’s CLEAResult, an Austin, Texas-based company that manages about 200 utility energy efficiency programs in 25 states. On Tuesday, it announced it was using Retroficiency’s Automated Energy Audit (AEA) product to cut the time and cost of energy audits, the key first step in any project, by up to 80 percent. Simply put, Retroficiency creates building energy models and reports without having to send engineers with clipboards and testing gear into buildings -- at least, not at first. It also aggregates those by address, making a portfolio view of buildings across a city or region that can be compared in multiple ways, including relative levels of energy waste, and likely costs of correcting those mistakes. The company raised a $3.3 million Series A round from Point Judith Capital in November, which includes an $800,000 angel round raised in 2010. North American utilities spent just under $3 billion in commercial and industrial customer energy efficiency last year, according to the Consortium for Energy Efficiency. Most of that is in direct rebates for projects, as well as money set aside for technical assistance on energy audits, marketing, program administration, and the like. That number has also been growing year after year, as more and more state utility regulators mandate certain percentage energy reductions through efficiency. Utility efficiency funding provides a key benefit for efficiency retrofit projects that are striving to pay themselves back within two to three years -- the typical ROI threshold for commercial building customers. Indeed, most of the high-profile retrofit projects we’ve seen in the past few years have relied on some sort of utility backing, above and beyond the benefits of energy cost reductions, improved maintenance and a better LEED or EnergyStar score. CLEAResult and competitors like GoodCents, Ecova and other utility contractors that go out and find customers for these programs are already using tons of software in the process, said Bill Younger, CLEAResult’s industrial relations program manager. Even so, picking out the right targets for a broad-scale rollout across a utility’s entire commercial and industrial base remains an onerous task of collecting and analyzing tons of data, often via spreadsheets, he noted. Retroficiency and competitors like FirstFuel, in the meantime, are promising to automate much of the initial auditing process, as well as to delve into the reams of available data to find insights unavailable to the human eye. The data can come from utility power meter records, property records, previous energy audits, weather reports and other sources, with hundreds of potential variables. Of course, not everything about a building can be derived from offsite data. At some point, engineers have to come in to scope a project, sensors and controls need to be installed, and building management systems need to be set up to optimize the ongoing operations of the building’s newly-tuned up HVAC systems, lighting, elevators, escalators, and the rest. That’s the realm of building controls giants like Honeywell, Siemens, Johnson Controls and Schneider Electric, as well as startups such as SCIEnergy, SkyFoundry, BuildingIQ and Powerit Solutions, to name a few. But making that initial process faster is critical, and so far, Retroficiency’s tool has worked to speed it up, Younger said. He mentioned one project for an unnamed utility where the partners have been able to speed up the turnaround time for audits from about five buildings a month to up to 30 buildings a month -- a six-fold increase in speed. CLEAResult works with regional contractors and other partners to deliver services, but the utilities are its end customer. Retroficiency’s customers include building owners and management companies like Jones Lang LaSalle and SAIC, as well as contractor partners like Schneider Electric and utility Iberdrola.